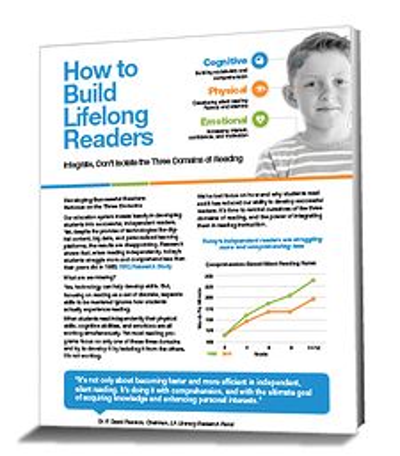 How the three domains of reading form the essential building blocks of reading success. Physical - developing silent reading fluency and stamina. Cognitive - building vocabulary and comprehension. Emotional - Increasing interest, confidence, and motivation. Why integrating, not isolating the three domains is the key to building lifelong readers. When students read independently their physical skills, cognitive abilities, and emotions are all working simultaneously. Yet most reading programs focus on only one of these three domains and try to develop it by isolating it from the others. Comprehensive research studies and briefs provide in-depth analysis of the three domains and the how integrating them in one reading system drives student achievement.